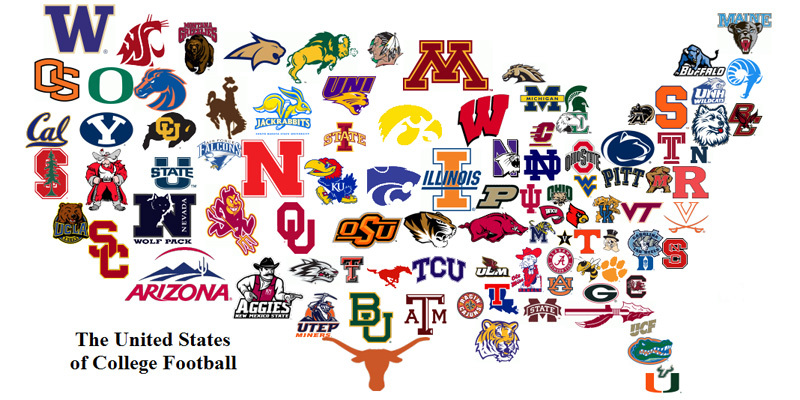 After a brief hiatus, College Football Nation returns. There’s a lot to catch up on, America, since the last CFN was published. We’re into July now — I hope everyone had an amazing 4th of July. It couldn’t have been much worse than Jason Pierre-Paul’s – and there are just 52 days until the 2015 college football season kicks off. Without further ado, here are a few things that have been going on in the world of college football in the past month or so. It seems that any quarterback who signs on with Florida State should consider immediately hiring a lawyer as well, these days. Freshman quarterback De’Andre Johnson was dismissed from the team on Tuesday by head coach Jimbo Fisher, after a Tallahassee bar’s security camera captured him punching a 21-year-old female FSU student in the face. Winston excelled on the field, but off the field was a different story. Authorities charged Johnson with misdemeanor battery and his attorney has entered a not-guilty plea, claiming he was provoked by racial epithets. Physically assaulting a woman is unacceptable no matter the situation, but Johnson, who is just 19, has only himself to blame because he was in a bar, somewhere he shouldn’t have been. 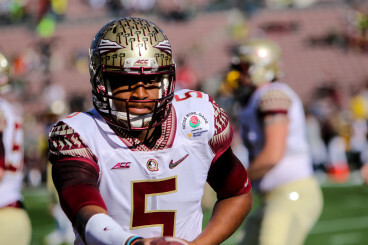 This is just the latest in bad publicity for Florida State after last season’s Jameis Winston saga. Former FSU cornerback and 2015 Buffalo Bills draft pick Ronald Darby voiced his interesting opinion on Twitter — which is never a good idea — and received some severe backlash for his stance. Johnson is scheduled to appear at a case management hearing in Leon County on July 22. In a rare Oregon–Michigan connection, the University of Michigan announced Monday it will part ways with Adidas as its official apparel provider and are now partnering with Nike. The deal is for 11 years with a UM option to add an additional four. Michigan was a top client for Adidas, which gave $8.2 million annually in gear and cash to the university. The Nike-Michigan financial details are to be released later in the week. The decline of Wolverine football coincided with Michigan’s switch from Nike to Adidas in 2006 and some fans attributed the affliction to the uniform switch. With Jim Harbaugh now in Ann Arbor, why not go back to the glory days to complete the revival? Everyone loves the potential comedy of watching an honored guest throw out the first pitch at a Major League Baseball game. There are all-time favorites like Curtis Jackson, a.k.a 50 Cent, then there’s this gem by Ms. Carly Rae Jepsen and the ballet that was Miss Texas‘ attempt. Alas, that was not the case Wednesday night when TCU quarterback and Heisman hopeful, Trevone Boykin, got his shot. The throw wasn’t a strike, but it made it the entire 60 feet, 6 inches from the mound to home plate. “Yeah, I didn’t bounce it, I didn’t 50 Cent it. I feel pretty good about it,” Boykin said in an interview with the Fort-Worth Star-Telegram. Boykin has a big season ahead after completing 2014 with 3,901 yards and 33 touchdowns, as well as finishing fourth in the Heisman voting. 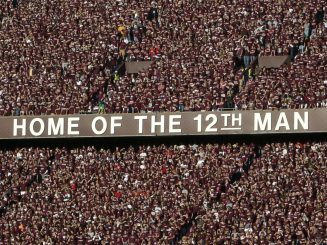 Kyle Field is about to get louder. Kyle Field is undergoing a major renovation for 2015. In 2013, the Board of Regents at Texas A&M approved a $450 million renovation plan for Kyle Field. The renovation would increase seating capacity to 102,500, making it the largest capacity stadium in the SEC – surpassing Tennessee’s Neyland Stadium by just 45 seats — and also the state of Texas. In early May, the cost of the project was bumped up to $485 million and with that increase, the renovations are now coming at an increased price for season ticket holders. The university has implemented a new seating plan and is asking for hundreds of thousands of dollars in order for fans to retain their current seats so it can pay the bill. Some fans have filed lawsuits, especially donors who received season tickets after making large donations to the university. Warren Moore, who donated $60,000 in 1985, said he and his family were promised seats for life per the Fort Worth Star-Telegraph. Moore said his family’s seats are now in the Prime Legacy West Club section of Kyle Field and he would have to make a $15,000 capital donation and $2,000 each season to keep his eight tickets. The tickets wouldn’t even be for the seats he originally had — they would just be in the same section. You can see the renovation plans and all the new amenities Kyle Field will offer for the years to come here. There’s another uniform change to announce in the Pac-12 as Adidas and UCLA unveiled brand new togs for the 2015 season on Thursday. The new uniforms are not noticeably different with the addition of a watercolor design print background on the body of the jerseys and the number font being altered. It’s more of a take on modernizing their classic look. You can see a small sample above and the full kit in this article courtesy of CBS sports. What do you think of the new UCLA uniform kits?